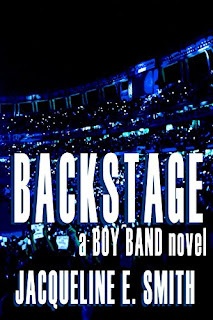 Last night, er, early this morning, I finished reading Backstage by Jacqueline E. Smith. It is the second book in her Boy Band Series. While I have never been one to follow music bands, music is a vital part of what I do. When poetry is written, I hear the notes. Rhythm and rhythm are integral parts. Having read other books by Jacqueline and loved her style of writing, I had to continue with the series. Right off the bat, she weaves in so many axioms. True relationships are complicated. We are pulled one way and then another, sometimes at the same time. That’s what Backstage is about: the balance of love, honor, integrity, and trust. The heart knows what it wants, but do you act on it? If you do, what happens to those around you? Is it for the common good? Is it only for your heart? When feelings are given free rein, there’s never an easy choice. Suspense, love, and heartbreak: you’ll find all that here. With Mel, Sam, Joni, and the others in the band, it’s never going to be simple, but isn’t that what love is all about? And now it’s time for the next one! A great read! If you haven't read it, you can find it here!